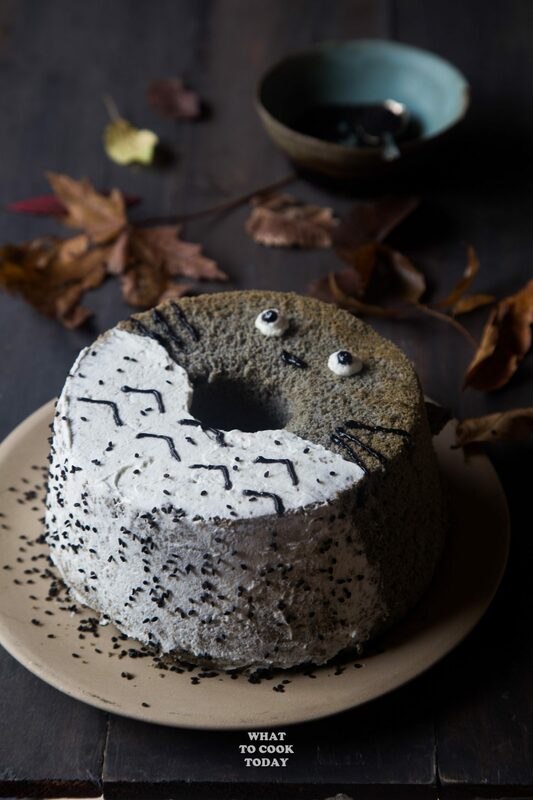 Nutty roasted black sesame seeds are infused all over this spongy, light and fluffy chiffon cake that resembles the adorable troll in popular Japanese anime character known as Totoro #BlackSesame4Halloween. 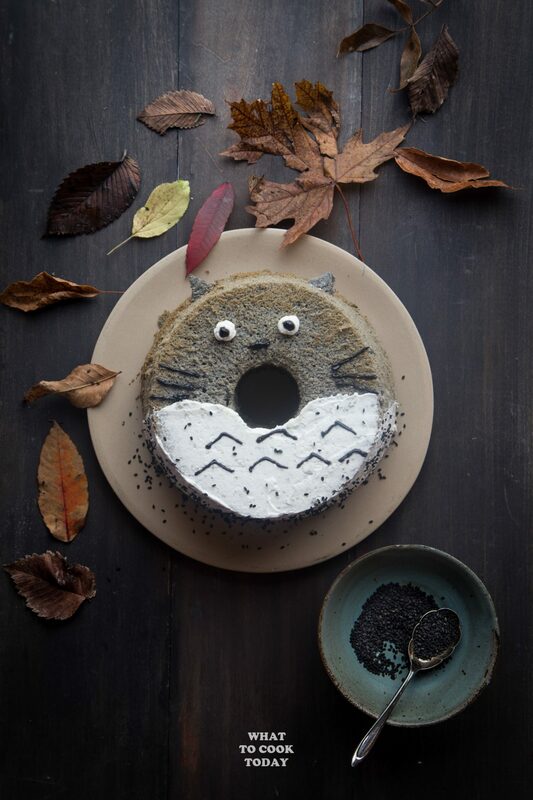 I’ve been wanting to make this Totoro chiffon cake for a while now. 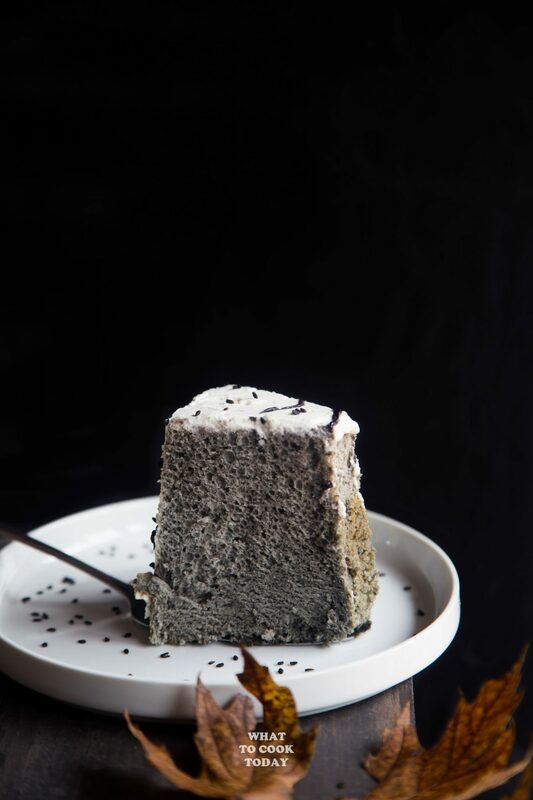 Alisa from Contemplating Sweets was kind enough to invite me to join her Black Sesame Party and I immediately knew I gotta make Totoro happened with black sesame seeds that I grind up into fine powder. It gives a nice gray hue to the cake. Mine is much darker because I added a bit of activated charcoal. You don’t have to. You might be familiar with white sesame seeds. 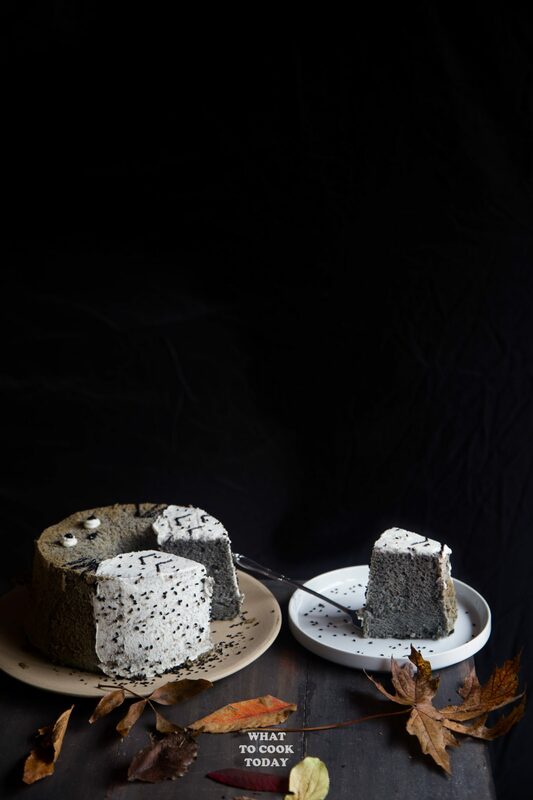 The black sesame seeds pretty much taste the same with the white ones if you ask me. The black sesame seeds have their hulls intact and hence the color. When you roast it slightly, it gives you that amazing nutty flavor that I really like. 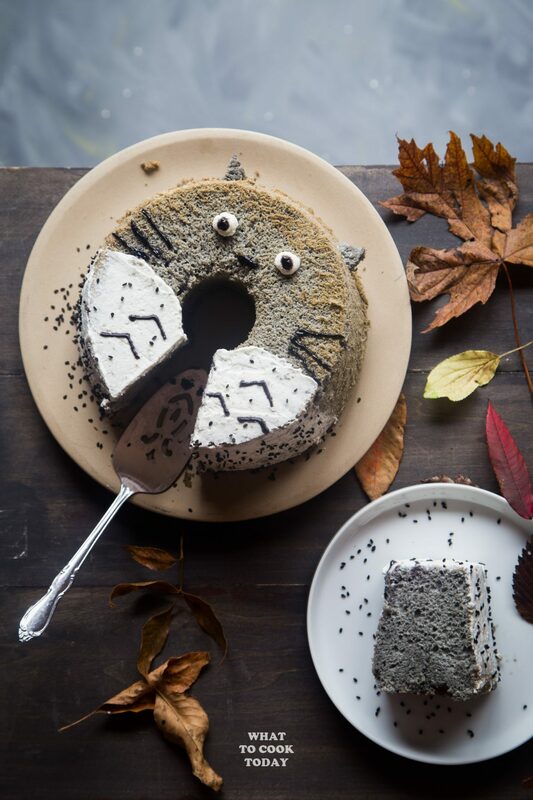 This Totoro Black Sesame Chiffon Cake was gone in 1 1/2 days after I made it! 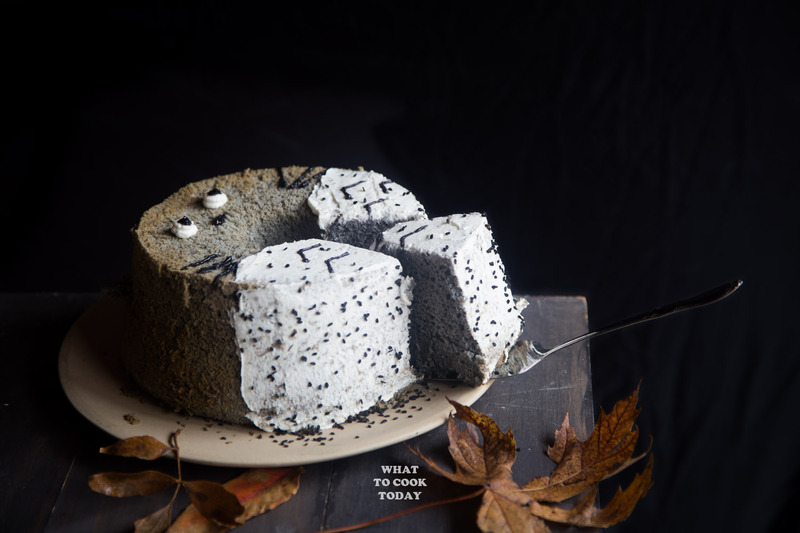 Once it's cool down completely, use a spatula knife to run through the edge of the cake to help release the cake. Gently push the base of the pan down. Use the knife again to run through the top of the cake to help release it from the base of the pan. There you have it !!! If you are using black icing writer, draw the black details only when you are ready to serve them, otherwise, the black icing will "bleed". You can frost the cake with whipped cream one day ahead though. 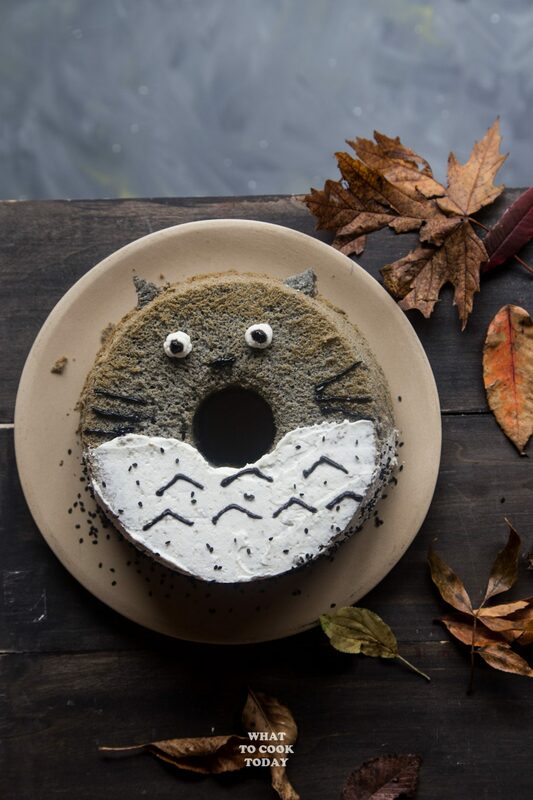 This cake is almost too cute to eat, but it doesn’t sound like that stopped anybody! LOL! It sure didn’t! 🙂 Somebody gotta eat it still ! Seriously, SO cute! I love Totoro! 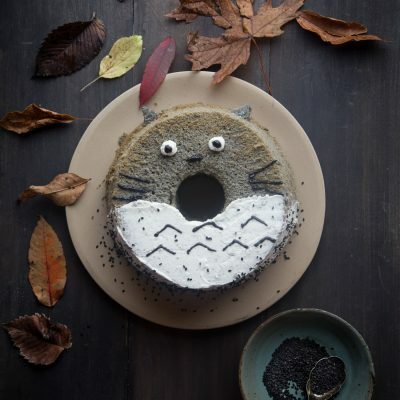 Your Totoro cake looks adorable! It reminds me of my stuffed Totoro at home :D. I still read manga and watch anime now, and Doraemon and Dragon Ball were a big part of my childhood too. I haven’t had the opportunity to try Japanese chiffon cake. I’m curious about its light and fluffy texture so hopefully I will be able to bake this cake one day (baking dessert is not my forte…). 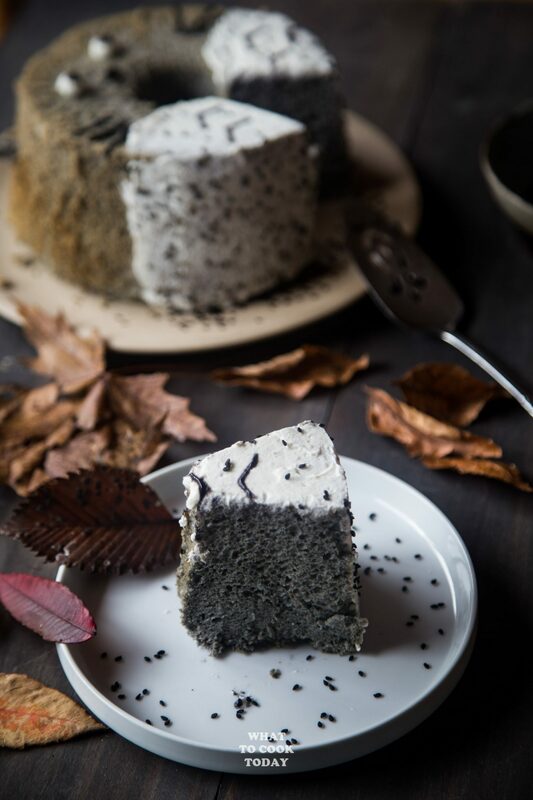 Thank you so much Alisa for organizing this Black Sesame Party! Thank you so much! I agree, love the soft and fluffy texture indeed! It looks so fluffy! I can see myself just staring at the cake and poking it to see it fluff down and fluff back up! Sooo cute! heehee! I defintely would not want to cut into this beauty! How neat! Will give this a try.